When I first started this blog four years ago, I had a very simple goal — to share my then developing pit/smoke firing know-how with others, one discovery at a time. Now, four years later, I have managed to file quite a few posts with enough pragmatic details for others to use as reference, or even as a starter framework for their own pit firing experiments. One thing has not changed much, though. My firing approach remains very specific to a rather personal obsession, a mad scientist-like urge to understand how different fuming effects can be arrived at with any given fuming material or firing process. To that end, my emphasis is on achieving a broad range of surface colors and effects; and it’s no coincidence that the primary form I’ve chosen for these experiment is a simple, anonymous, and unassuming river rock form — which essentially serves as a neutral canvas to receive fuming marks, and which will not call attention to itself and distract the viewer’s focus from those fuming effects. So this is why I’d cringe a little, sometimes, when approached by someone wanting to use my firing methods for their very expressive figurative sculptures, or for some other highly specific and well articulated forms. More often than not, I would end up telling them, well, yes I’d love to help you, but you really ought to look into these other ways, too. Unfortunately, as I tried to scrounge the Web for free information on these more specialized firing approaches, I came up nearly empty handed. What we do have are tips and how-to’s for the more typical firing, some of which are listed in the Resources Page of this blog. This does not mean, however, that there are no good information available out there — it’s just that they are not on the Web, but instead are buried in a handful of excellent books (figure 1) on pit/smoke firing, which you can find listed in my Resources Page as well. One of these days I’ll have to write a proper review for the books listed there, instead of just telling you to buy them all, as I did. :-) But since this is a post about other specific ways to pit/smoke fire, for now I will simply focus on a few artists whose work I like, and whose firing approaches are quite different from what I’m currently doing, to give you a taste of what else is available out there. I’ll start with figurative sculptures. One artist that I like a lot is Susan Halls; some of whose work can be seen here and here. 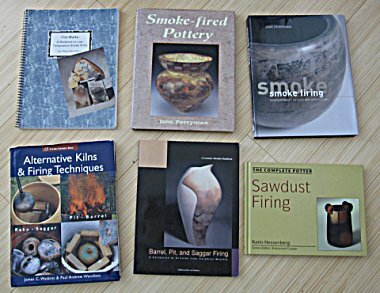 While there is hardly any description of her working methods online, they are actually very well documented, even with good illustrations, in the following books: Sawdust Firing by Karin Hessenberg, and Smoke Firng: Contemporary Artists and Approaches by Jane Perryman. And for those of you working with abstract and elegant forms, Gabriele Koch is someone whose work you really cannot afford to miss. She does not appear to have a website, but you can see some images of her work here, here, and here. There is a brief description online of her working methods; additionally, an article by Tony Birks for an exhibition catalog describes her aesthetics and methodologies in more details. However, the best information on Gabriele Koch is to be found in books as well: Sawdust Firing by Karin Hessenberg, Ceramics: Smoke-fired Pottery and Smoke Firng: Contemporary Artists and Approaches, both by Jane Perryman. All three books cited above contain a good section on Koch and her work. She also has a monograph out, though I have not been able to get hold of a copy yet. Okay, as I’m trying to finish this blog post, I noticed that all three of the approaches I suggested above are ones that I’ve wanted to try out myself. In other words, this is still all about what I do or plan to do. Furthermore, I’m still only dealing with the firing of smallish pieces that can be carried out quickly, in a small pit in one’s own backyard, not generating too much visible fumes and smoke — since my pit firing practice is constrained by the urban/suburban environment in which I live. But for those of you who are working in a different setting, e.g. in the country side, where making a bit of smoke is not a problem, or who have access to different equipment, e.g. a gas or wood kiln — or even a raku kiln — you actually have many other options that are quite different from both mine and the ones mentioned above. For example, the closely related methods of saggar firing are well worth your consideration. I myself have started my career in smoke firing from a saggar workshop with Maria Spies in 2002, have played with saggar firing on and off since then, and would probably do more if I had better access to a gas kiln or raku kiln. So what I am saying is, well, don’t limit yourselves to just what I have on offer here. There are many, many other ways, and you really ought to check them all out, too. Really. This entry was posted on Monday, December 13th, 2010 at 12:26 am and is filed under Pit Fired Pottery. You can follow any responses to this entry through the RSS 2.0 feed. You can leave a response, or trackback from your own site. Hi are you still infected with the kiln inventing bug? YOu might be interested in Rocket Oven which was used to fire bricks, kiln shelves plus hundreds of pizza and turkey. All the best!